LED lights are more efficient because they need far less electricity to provide the same amount of light, but then people might install more and more lights in a behavior called the "rebound effect"
They were supposed to bring about an energy revolution—but the popularity of LED lights is driving an increase in light pollution worldwide, with dire consequences for human and animal health, researchers said Wednesday. 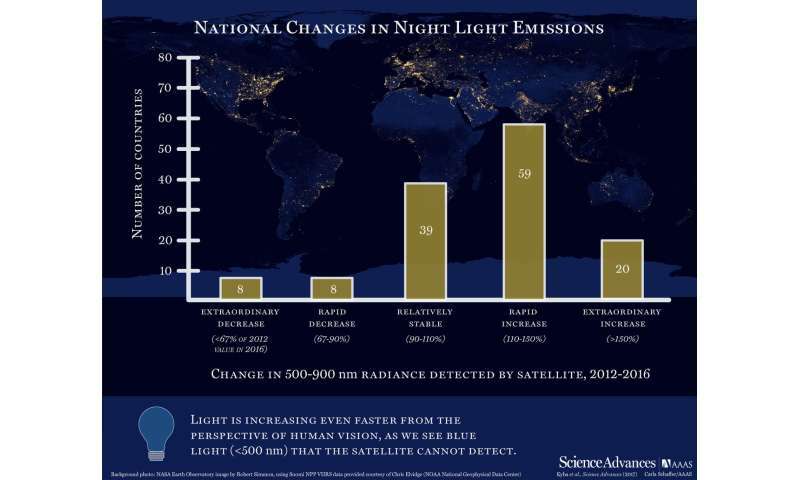 The study in the journal Science Advances is based on satellite data showing that the Earth's night is getting brighter, and artificially lit outdoor surfaces grew at a pace of 2.2 percent per year from 2012 to 2016. Experts say that's a problem because nighttime lights are known to disrupt our body clocks and raise the risks of cancer, diabetes and depression. As for animals, these lights can kill—whether by attracting insects or disorienting migrating birds or sea turtles. The issue isn't just the LED lights themselves, which are more efficient because they need far less electricity to provide the same amount of light, explained lead author Chris Kyba, a physicist at the German Research Center for Geosciences. Rather, it's that people keep installing more and more lights, he told reporters on a conference call to discuss the research. "We'll light something that we didn't light before, like a bicycle path though a park or a section of highway leading outside of town that in the past wasn't lit," he said. "And so all of those new uses of light offset, to some extent, the savings that you had." Experts call this the "rebound effect," and it can be seen with fuel-efficient cars, too. People may buy a car that requires less fuel, then decide to drive it more often or move further from work, lengthening their commute. 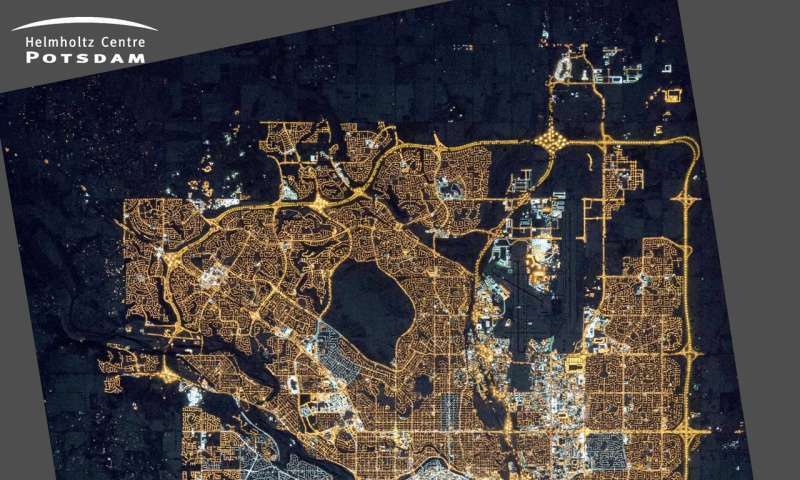 The study was based on the first-ever radiometer designed especially for nightlights, called the Visible/Infrared Imager Radiometer Suite (VIIRS). "With few exceptions, growth in lighting occurred throughout South America, Africa, and Asia," said the report. Some of the world's brightest areas, including Italy, Netherlands, Spain and the United States, were all relatively stable. "The fact that we did not see the country get darker means that there were new lights in other places, or else brighter lights that were in some other cities installed that make up for this difference," said Kyba. Researchers also warned the data was likely an underestimate, because the satellite is unable to pick up the blue wavelengths that are prominent in many LED lights. "We can say with fairly high confidence even though we didn't measure in the satellite an increase in these countries, they are nearly certainly increasing in brightness in terms of how human beings would perceive the light," Kyba said. One co-author of the study, Franz Holker, an ecologist at the Leibniz Institute for Freshwater Ecology and Fisheries, said the data reveal "quite a critical problem." "Many people are using light at night without really thinking about the costs," he told reporters. Seeing the big picture from above, he added, "completely changed how I use light at night." Excess nighttime light not only harms natural habitats and makes stargazing impossible, it also costs nearly seven billion dollars annually in "negative impacts on wildlife, health, astronomy, and wasted energy," according to a 2010 study in the journal Ecological Economics. The latest findings are "not a big surprise to people who have been following this issue," said Travis Longcore, an assistant professor of architecture, spatial sciences, and biological sciences at the University of Southern California School of Architecture. Longcore, who was not involved in the study, described the 2.2 percent annual growth rate as "unsustainable." 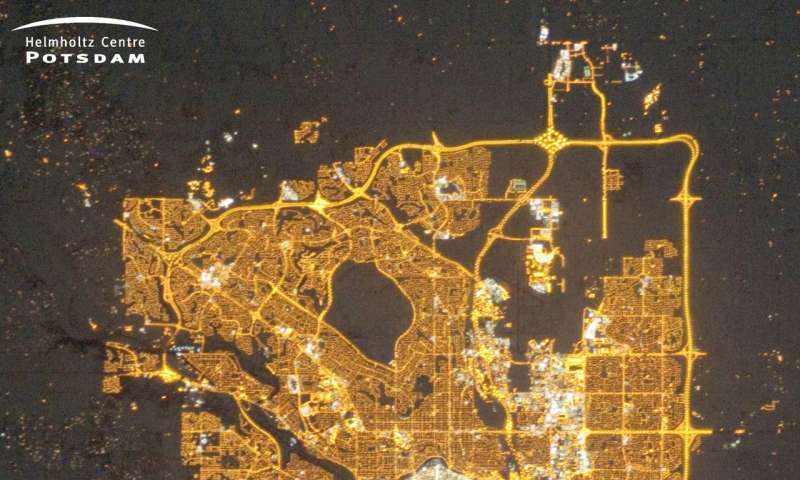 The Arizona-based International Dark-Sky Association's executive director J. Scott Feierabend said the study "validates the message IDA has communicated for years" about the hazards of artificial night lights. Solutions include using lower intensity lights, turning lights off when people leave an area, and choosing LED lights that are amber instead of blue or violet, since these tend to be the most harmful to animals and humans, experts say. "There is no conclusive evidence that additional light reduces crime," Longcore told AFP. "In fact, there is some evidence that shows that additional lights increase crime because criminals can see what they are doing," he added. "A lot of things we assume are necessary are just not. They are overkill." Not quite. 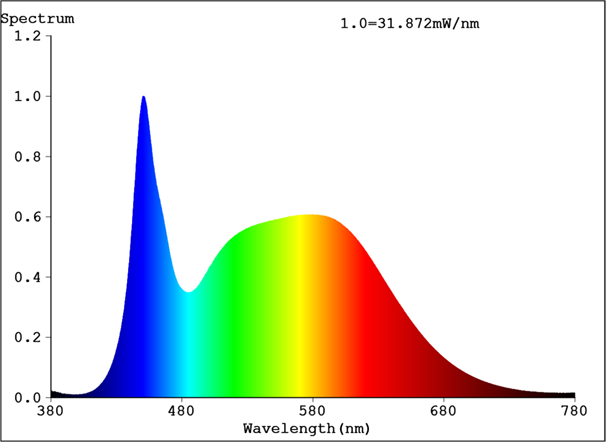 Only the blue and near-UV wavelenghts mess up with melatonin production and cause the effect. That's why you're better off with a standard halogen for your reading light - it won't keep you up at night. The title is misleading. 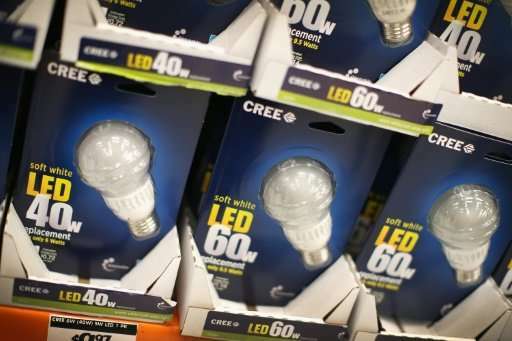 LED lights cut carbon pollution by drastically reducing energy consumption and they do that VERY WELL Readers only skimming the titles may assume that somehow LED lights increase CO2 emissions and that is FALSE. Plus, LED lights last many times longer than other lights so the environmental cost of making and shipping new lights to customers is greatly reduced. The slightly increased overall light output is worth it, and future LED emissions can be tuned to better simulate natural light. Having had LED street lights installed around my town I can tell you that from an astronomical point of view, these are much better at full cutoff and elimination of skyglow than the old mercury or sodium vapor lamps; and I have no doubt they use much less power as well. And it's not like people are going around installing extra street lights. So more places are becoming safer to drive or walk at night, further reducing crime, and more poor nations are becoming wealthier and installing lights which reduce crime and make places safer to travel at night—which comes a lot earlier during the winter. So much good news but apparently not for the "light pollution" crowd. If you want to see lots of stars at night, move away from the city, or go camping or something. So many people are afraid of the dark. Seriously, outdoor lighting should be installed in full-cutoff fixtures that reflect all the light to the ground rather than losing any to the sky. Candle flame amber (as mentioned in the article, easily obtained from LED's) gives optimum results, allowing our eyes to adapt to lower light levels and causing less momentary glare-blindness. Thus, more comfort, a better view of the ground for walking/driving, and less spillover to your back yard, where all-night light only makes it easy for drive-by alley opportunists to spot an unsecured bicycle or scope out your property. As well, amber attract fewer insects. And private lighting should be on motion sensors. Why pay for light you're not using? Plus you gain security - if the light comes on, you're alerted to someone's presence. If the light is always on, you won't know unless you happen to be looking out. And for @assdad: so, throwing light up into the sky somehow magically helps catch burglars? I'd have thought if you wanted to stop crime you'd want to put as much light as possible on the ground. On Earth. How does that work, exactly, @assdad? Just assin'. Strong lights pointed at the ground tend to reflect up into the sky, especially in the winter when there's snow everywhere. Problem is, LEDs are not efficient at that wavelenght. Low pressure sodium lamps known for the yellow glow achieve 100 - 200 lm/W while amber LEDs get about 50-100 lm/W. If you don't require "white" light, there's no point in using LEDs.